Mille crêpe is a cake made with many layers of crêpe (thin pancake). Mille means "a thousand" in French. Although it is written in French, it is originated in Japan (I found this info on the Net). And of course, it is a very popular cake in Japan!!! I used nutella and whipped cream for the fillings. Of course you don't have to make Mille Crepe. You can just wrap your favorite filling in a sheet of crepe and enjoy! Difficulty: Easier than you think! 1. Sift the flour in a bowl. Add sugar and egg, and mix well with a wire whisk. 2. Add half the milk and melted butter, and mix well. Strain the batter to remove lumps. Then add the rest of the milk and a few drops vanilla extract, and mix until smooth. 3. Cover with a plastic wrap and leave the batter to stand at room temperature for 30 minutes. 4. Use a nonstick pan, or wipe the surface of the frying pan with a thin layer of cooking oil using a paper towel. Heat the pan on medium, pour a ladleful of the crepe batter into the pan, slowly move the pan in a circular motion to spread the batter evenly. 5. Cook the crepe until the edges begin to dry, then flip the crepe over and cook the other side for about 10 seconds. 6. Leave them to cool completely. 1. Combine fresh cream and granulated sugar in a dry, clean bowl. Float the bottom of the bowl in ice water, whisk the cream until it forms a soft peak. 2. Place one layer of crepe on a plate. Spread the cream. Place another layer of crepe, and spread nutella. Repeat until you have used all the crepes. 3. Rest the cake in the fridge for 1 hour and cut into half. 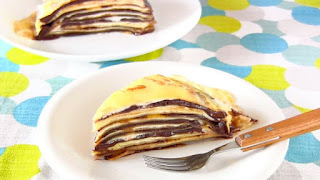 Spread nutella (use it as a glue) and place the other half on top to make a half round mille crepe cake. 4. Then again rest in the fridge until chilled and nutella hardens up. In this way, you can easily cut the cake.